Civil and Environmental Engineering provides innovative solutions at the interface of the natural and the built environment for the benefit of society. As such, education and research addresses the efficient design, maintenance and sustainability of infrastructure while preserving and sustaining natural, social, and economic resources. 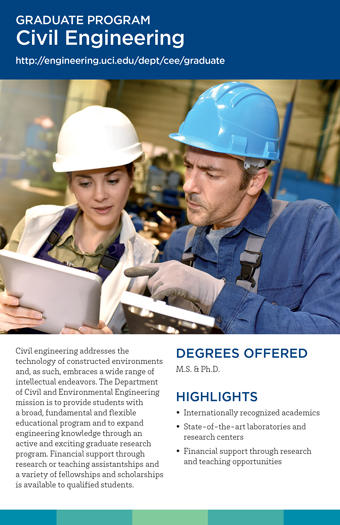 The Department of Civil and Environmental Engineering focuses its graduate study and research program on four areas: Structures, Geotechnics, and Materials, including civil infrastructure materials, engineering mechanics, advanced composites, structural dynamics, performance-based earthquake engineering, geotechnical engineering, and reliability and risk assessment; Transportation Systems, including traffic operations and management, advanced information technology applications, travel behavior, and transportation systems analysis; Hydrology and Water Resources Systems, including dynamics of the hydrologic cycle and climate induced variability, flood and drought prediction and mitigation, and remote sensing of hydrologic systems; and Environmental and Energy Systems, including environmental pollution mitigation, water and air quality, water treatment technologies, water and energy nexus, and renewable energy. The Department offers the M.S. and Ph.D. in Civil and Environmental Engineering. At the point of application, a student is required to choose one of four focus areas: Structures, Geotechnics and Materials; Transportation Systems; Hydrology and Water Resources Systems; or Environmental and Energy Systems. Once admitted, each student will be assigned an advisor from among active faculty in their focus area. Financial support through research or teaching assistantships and a variety of fellowships and scholarships is available to qualified students and highly competitive. Interdisciplinary study in one or more areas outside of the student’s primary focus area is strongly encouraged. This area emphasizes the application of analytical, numerical, experimental, and practical approaches to the investigation of built infrastructure systems that withstand natural and man-made loads and hazards. Specific interests include sensors and structural health monitoring, composites for infrastructure applications, reliability and risk assessment of civil engineering systems, structural control, system identification and damage detection, performance-based earthquake engineering, soil-structure interaction, smart materials and structures, multi-scale modeling, and sustainable green materials and infrastructural systems. Among leading centers for transportation research, the department offers a graduate research area that is distinguished by its interdisciplinary approach to the study of current and emerging urban transportation issues and through its partnership with the UC Irvine Institute of Transportation Studies. This area focuses on the planning, design, operation, and management of complex transportation systems. Emphasis is on the development of fundamental knowledge in engineering, systems analysis, modeling, and planning, combined with advanced computational techniques and information technologies, to address transportation problems affecting urban travel and goods movement. Developing sustainable water supplies while preserving natural resources and the environment is a grand challenge in the 21st century requiring interdisciplinary thinking and engineering solutions. This area focuses on fundamentals and the use of mathematical, computational, and experimental approaches to understanding the dynamics of the hydrologic cycle, transport within aquatic systems, and the impact of human activity, particularly in urban areas. Specific areas include water resources planning, remote sensing of the environment, water-related hazards such as floods and droughts, and transport in land, oceans, and the atmosphere. Treatment, distribution and collection of water and wastewater are energy intensive operations, and energy generation and distribution have direct and indirect impacts on environmental systems. This area addresses these interrelated challenges by focusing on the treatment and supply of water for municipal, agricultural, energy, and environmental uses, sustainable practices for managing urban stormwater, and chemical and microbiological processes for water treatment. Additionally, novel approaches for energy generation and distribution are covered in this area. Understanding and minimizing emissions of greenhouse gasses associated with water and wastewater treatment and energy generation and distribution are common themes in this area.